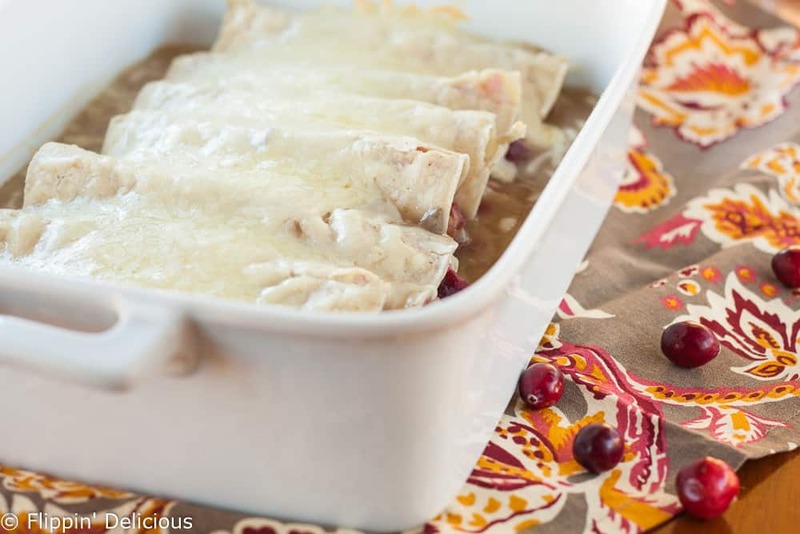 These Gluten Free Cranberry Turkey Enchiladas make the perfect day-after-Thanksgiving meal. Roasted turkey, creamy gravy, and fresh cranberry sauce rolled in warm corn tortillas and topped with gooey melted Monterrey Jack cheese. If you are anything like me, half of the reason I love Thanksgiving is because of all of the leftovers. So many good leftovers! My favorite stuffing, fresh cranberry sauce, mashed potatoes, and turkey. 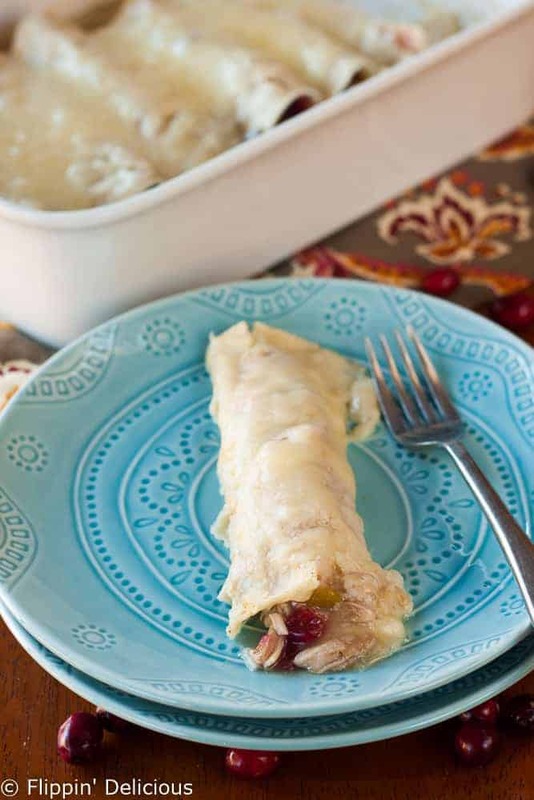 One of my favorite Thanksgiving leftover dishes are these Gluten Free Cranberry Turkey Enchiladas. They were one of those happy accident meals that my mom made by mixing together all of the leftovers on Black Friday. Now we look forward to it every year! It is super simple, you really just moisten your leftover shredded turkey with some leftover gravy (and a little green chile, I am a New Mexico girl after all! 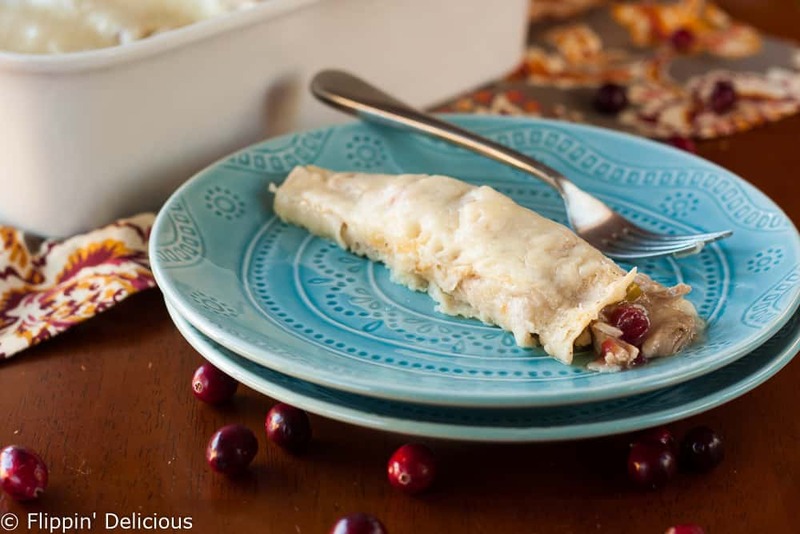 ), roll the mixture up in gluten free corn tortillas spread with just a little bit of homemade cranberry sauce.Then top your casserole with some more leftover gravy and a generous sprinkling of Monterrey Jack or your other favorite cheese. I’m a part of the Jennie-O Switch Circle blogging group, so they occasionally send me products to try. Like this turkey. (DISCLAIMER: I received free product from Jennie-O to try out.You are hearing about it because I thought it was awesome and I wanted to share these enchiladas anyways.) 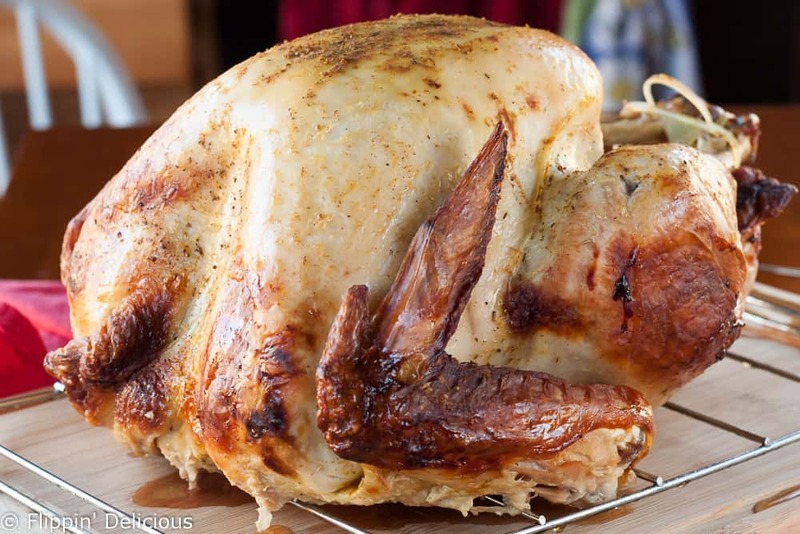 The no-thaw, oven ready turkey they sent me is a serious game changer for Turkey Day! I started making the turkey for my family when I was a teenager. I would always wake up super early to get the turkey in the oven, and it was also a huge nuisance to thaw it. How many times have you gone to put your Thanksgiving bird in the roasting pan only to discover it was still frozen? The concept of a no-thaw turkey is a little genius. All you do is take the frozen bird, cut several slits in it’s baking bag, and roast it for about hours. I was a little sckeptical at first, but really impressed with the finished product. The drawback is that the skin doesn’t get crisp or brown, but the turkey itself is really moist. It also came with a gravy pack that didn’t have any gluten! I’d never used a gravy pack before, but it was one less thing that I had to worry about. I had all of my family over for an early feast and my kind brother-in-law made the gravy for me. Since I was trying to do 10 other things too. Basically a fool-proof turkey. I figure there are enough things to do on Thanksgiving Day, I liked not having to stress about turkey prep. If you need more recipes for the holidays be sure to check out Yummly! It is a recipe website that allows you to search by ingredients and diet needs. I love browsing Yummly and all of the recipes from Flippin’ Delicious are on there too! Spread a little bit of gravy over the bottom of a casserole dish or 9x13 pan. Preheat oven to 350F. Mix ½-3/4 cup gravy in with the turkey (just enough to have it be nice and moist) and add the desired amount of diced green chile. Warm your gluten free corn tortillas (to reduce breakage) and spread each tortilla with a spoonful of cranberry sauce and then fill with the shredded turkey. Roll and place in the casserole dish. Pour the remaining gravy over the enchiladas and sprinkle with cheese. Bake at 350F for 25-30 minutes, or until heated through with melted cheese and bubbling gravy. This is a leftovers recipe, so all measurements really are approximate. Just use the amounts that you have or customize it to you liking. Well that’s total comfort food! T-day eats and mexican! Haha, yep. Comfort food at it’s best! I LOVE this idea! I think it might be a game changer for our Thanksgiving leftover since I’m not a huge turkey sandwich fan. These turkey enchiladas look delish! I am a sandwich fan, but I think these enchiladas blow a tk sandwich out of the water. So creative, an unexpected combo with delicious results! Love it! I did! We really are two peas in a pod. Great minds think alike! What a unique idea for using up leftover turkey. love it! This look wonderful! I think I have a new idea for what to do with leftovers tomorrow and cannot wait to see what the family thinks! We always are looking for new ways to use our leftovers, and with turkey during the holidays, this can sometimes be a little difficult. My family demands variety and while many people may have the ability to get away with the simple turkey sandwich, not so in my house. Not only this, but with my family always loving enchiladas and fajitas, this is the perfect way to accomplish that and use leftovers, while also guaranteeing I have all the ingredients sitting in the kitchen! Thanks again! Thanks Kristie! I hope you and your family really enjoyed them. Fajitas would be fun to try too.